Turn Heads Fast. Turn Tables Faster. Digital Dining’s wireless handheld POS for restaurant will increase a restaurant’s overall performance, streamline its operations, and increase profits. The mobile handheld POS enables servers to receive and send orders in any size restaurant without ever leaving the dining area or running to and from a stationary POS terminal. The Digital Dining mobile POS is fully integrated with Digital Dining’s standard suite, so you can add it to existing systems quickly and easily. The interface is consistent with the standard POS, so servers can start using it with almost no extra training. Large-party tables are much less stressful, requiring a single server to receive and send an order that many restaurants would assign to two or three servers. With Digital Dining’s “Send & Stay” feature, the drinks are being delivered from the bar before the server ever leaves the table! 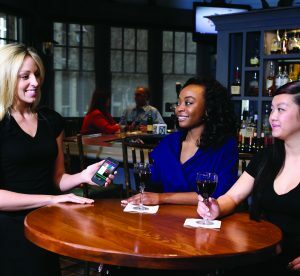 The Handheld POS also strengthens existing features, such as “item out alternatives,” by enabling servers to provide immediate feedback to customers. Use “Send & Stay” to send drink and appetizer orders on large party tables without ever leaving the check. Never miss an upsell ever again, and improve customer service by getting the modifiers on complicated orders right the first time – every time. Our automated up-selling system works flawlessly, reminding servers to ask for those special sides and appetizers. Armagh also has handheld payment solutions with “pin & chip” and “tap & pay” that are integrated with Digital Dining and work in conjunction with wireless handheld POS devices for seamless tableside customer service. Never make a payment terminal key-entry mistake again! The Digital Dining POS is compatible with all major operating tablet and mobile operating systems including Apple iOS iPad, iPad Mini, and iPod; Google Android and Windows devices. This ensures that your POS is future proofed! If you’re looking to streamline your restaurant’s service, increase profits, and improve customer service, Armagh and Digital Dining have the perfect mobile POS solution for you!